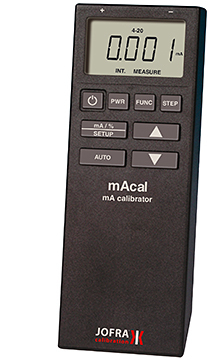 The mAcal Loop Calibrator is an economical and easy-to-use calibration device for sourcing and measuring mA signals. It is designed specifically for 2-wire transmitter loops with 4 to 20 mA signals. The keypad is labeled for easy operation, and includes timesaving one-key-one-function access to step functions and loop supply power. The large display clearly shows milliamp (to 0.001 mA), percent, voltage, or seconds, and also includes error codes for loop mismatch, reverse polarity, and over range.